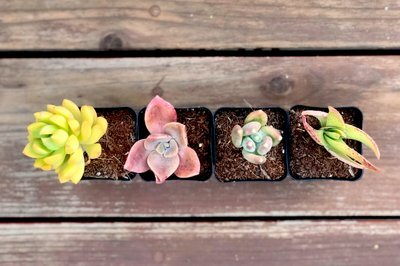 Enter your email address below to receive a notification when Succulent Studios starts accepting new sign-ups! Enter your email address below to receive a notification when Succulent Studios is accepting new sign-ups again. Your first box will ship just 3-5 business days after your order is placed. Please order by 11:59pm on the last day of the month to get that month's box. For existing subscribers, we ship 3-5 business days after the monthly anniversary of your subscription. For holiday gifts, place your order by Dec. 17 for delivery on or before Dec. 24. Brightens any space -- makes the perfect gift! 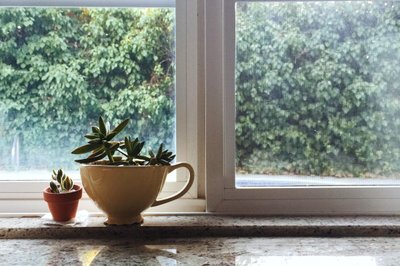 Two unique succulents every month; no repeats for at least 18 months. Fast, flat-rate shipping anywhere in the country. Ships just 3-5 business days after you order! 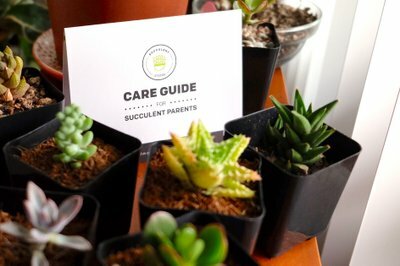 Easy-care instructions included for new plant parents. 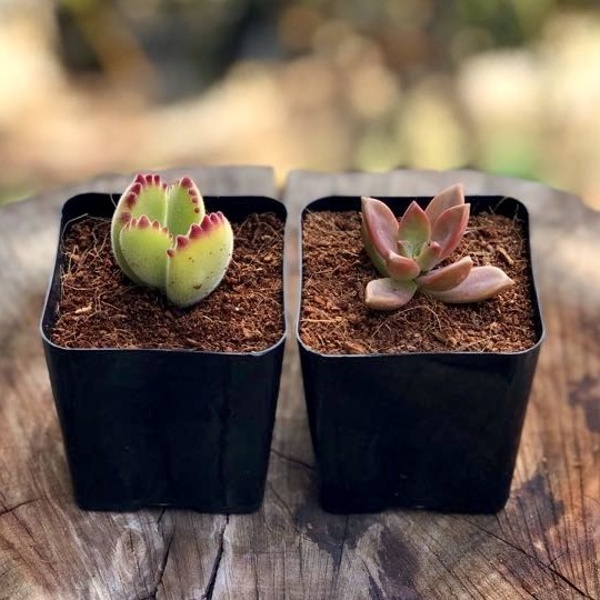 Each succulent received is beautiful and unique. yet small I only gave 4 stars due to the small size of each succulent. Bought a three month gift subscription, canceled prior to renewal, it renewed anyway, they refunded, got charged again the next month, canceled again, they refunded again, currently in the middle of the loop again. 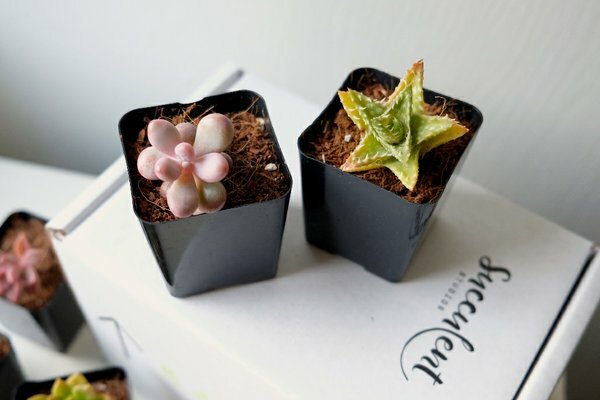 Succulent studios says contact Cratejoy, Cratejoy says contact succulent studios. Annoying! I'm looking forward to my next order. They are tiny but very healthy. I got this as a gift for my daughter. She loved the first shipment and they were pretty well packed as well . They come with instructions so that even I can't kill these poor thing's. So far they are doing great! Can't wait to see the next box! The problems with my mailman not being able to read "this side up" messages aside, this is a great box. The plants are awesome and the curated picks are far more diverse (and neater) than I can find locally. I did lose one succulent, my star cactus (need to find another one, he was awesome), but the rest are thriving. Beyond the plants, the customer service has been spectacular. 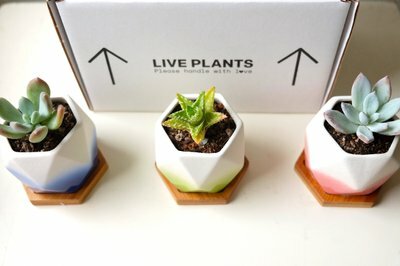 They've been quick to respond, helped with my succulents and when a box was late got it to me in 2 days. 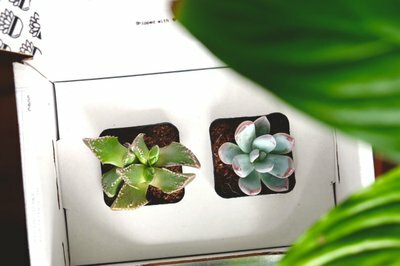 Finally, the succulent studios website is great -- instructions there helped me save an aloe I've had for years that had broken and that success led me directly to subscribing. Also, you should really check out the care cards you can find on the site, absolutely adorable and will give you a good idea of what you can expect. I got my first box and it was packaged well. One plant did come loose but I did replant it and it was fine. Soil was dry but plants were healthy. I liked the card that came with the plants that showed a picture and a description of each plant, so I can keep up with what each one is. Looking forward to next box. I've had 3 shipments, and out of 6 total plants, 3 are surviving. I will keep it up a few more months to see if maybe future shipments will thrive better as the temperature outside improves. 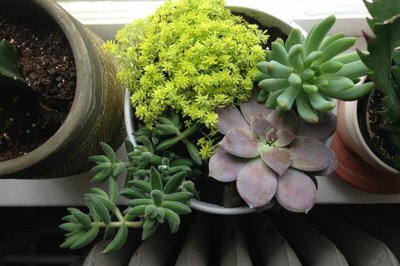 The succulents they've sent me are of varieties I otherwise don't have yet so I do like the plants I've been receiving. I’ve been getting this box for about 9 months now and I just love it. My plants have come in looking bright and healthy every time. I had one plant uproot itself in shipping but i just plunked in back in its pot and everything is just fine. This box is just fun and it makes my day just a bit brighter. 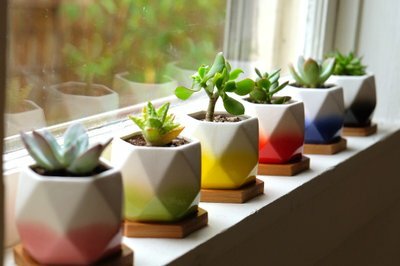 Thanks Succulent Studio! You guys are awesome! This is a fun super affordable box! I really enjoyed getting a new succulent in the mail. It arrived in perfect shape and is on display at home! Thanks! 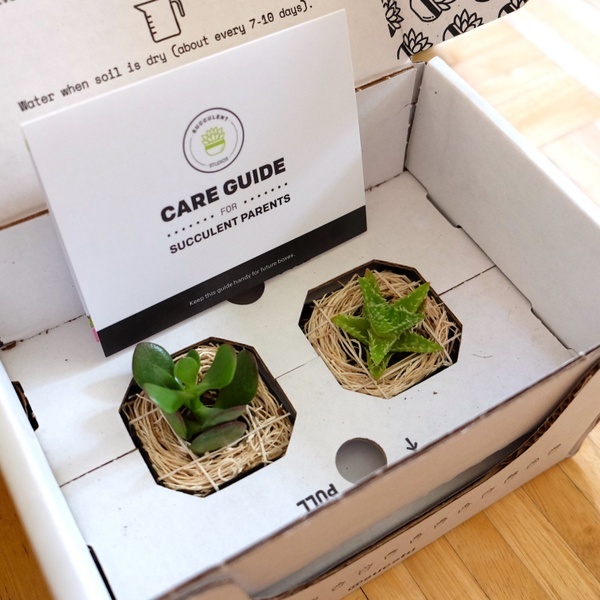 My succulents came in the mail perfectly fine and I would recommend this subscription. 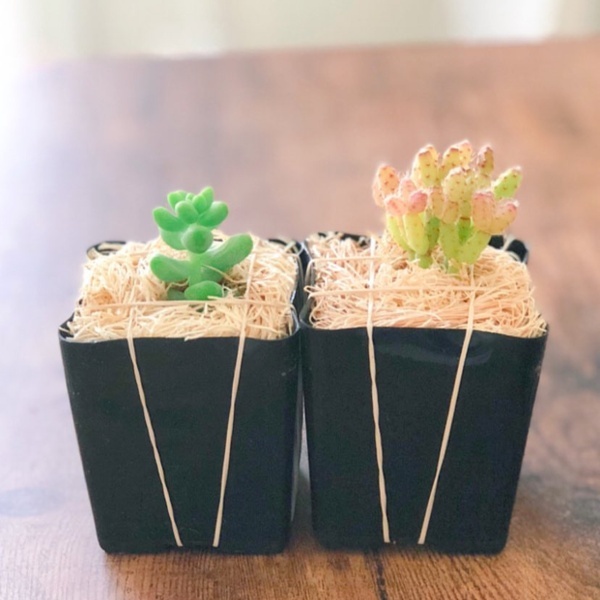 Our August box included a Baby Donkey's Tail (left) and Drunkard's Dream (right). 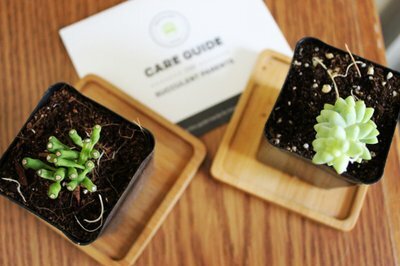 Our September box included a Dwarf Jade Plant (left) and Tiger Tooth Aloe (right). 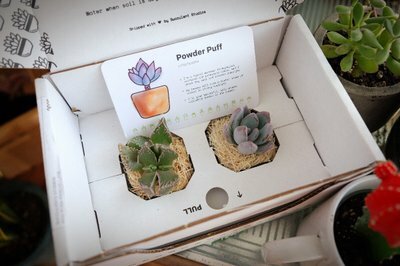 Our June box included a Bear's Paw (left) and Graptosedum 'Bronze' (right).